It's the handbook no half-blood should be without: a fully illustrated, in-depth guide to gods, monsters, and all things Percy. This novelty companion to the best-selling series comes complete with trading cards, full-color diagrams, and maps, all packaged in a handy, "manual-size" POB with a crisp, magnetic flap enclosure. 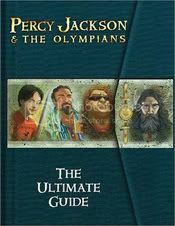 Not much to be said about this companion volume to the main Percy Jackson series. Nothing new is revealed here, and quite a bit of the artwork has been already used elsewhere. If you're really in need of a Percy Jackson fix, this could be just what you're looking for, but don't expect anything that's going to blow you away. It's not bad, it just seems a little like overkill to me. I guess I was just expecting something maybe a little bit more. I may have sounded a little too harsh on the book. Riordan does go into a little more detail on some of the myths that his characters are based on, so that for those that aren't as familiar with the myths will have a slightly better understanding of them and the ways they tied into the Percy Jackson books. I think those bits would be helpful for younger kids who aren't as knowledgeable about the myths. And this is what I need to remember; that the book is written for a younger audience, and to them, this might be the perfect thing, giving them a little taste of their favorite characters right before the movie comes out.